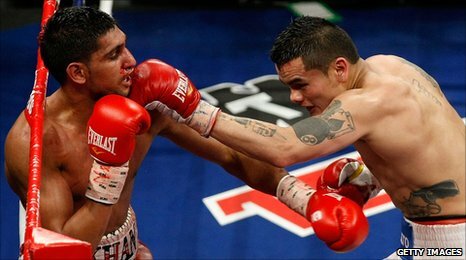 Amir Khan will not defend his WBA light-welterweight title against Paul McCloskey after negotiations between the two camps broke down on Thursday. It was believed that the two had previously agreed in principle to fight in Manchester's MEN Arena on 16 April. A statement from McCloskey's promoter Barry Hearn branded Khan's offer to his fighter as "totally derisory". "The deals placed on the table were an insult to Paul, an undefeated fighter and a European champion," said Hearn. "You have to pay your opponents to step in the ring with you, and pay them fairly," he added. The percentage share of ticket sales commission and pay-per-view revenue appear to have been the major sticking points between the two parties. McCloskey claimed the European belt in November 2009 with a ninth- round stoppage of Daniel Rasilla and defended the title twice last year to take his unbeaten record to 22 fights. "We have a huge fight lined up for Paul at the King's Hall in the spring and who knows, down the line he could face Amir as a world champion himself in a 50-50 split fight," stated Hearn. Last week, Khan's father Shah said that an offer had been made to 31-year-old Dungiven fighter McCloskey. "It is up to them to decide whether to accept it," Khan told the BBC at the time. "We have offered him almost three times what he got paid for his last fight and the ball is in their court - it can happen if they agree to the terms." Khan has stated his aim of unifying the division this year. He wants to fight the winner of the forthcoming bout between the US fighters Timothy Bradley and Devon Alexander on 29 January.